Sonoma County – Go Local! Groundwater Pump and Well – Launched! 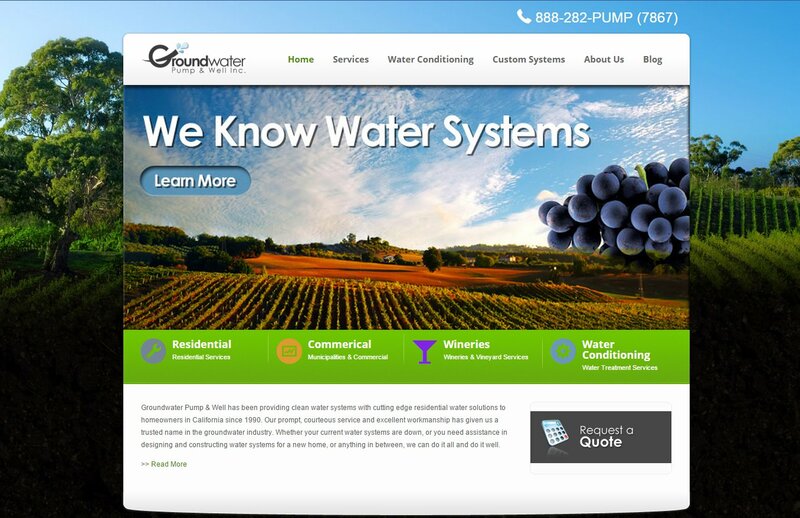 Groundwater Pump & Well has been providing clean water systems with cutting edge residential water solutions to homeowners in California since 1990. Our prompt, courteous service and excellent workmanship has given us a trusted name in the groundwater industry. Whether your current water systems are down, or you need assistance in designing and constructing water systems for a new home, or anything in between, we can do it all and do it well. We’ve just launched their new site, created on the WordPress Platform. We’ve also integrated our new Newsletter service, allowing them some great new marketing options that weren’t available before. We’ve also gotten their email powered by “Google Apps for Business” giving them all the power of Google & Gmail behind the scenes for their email. Every facet of the site has been upgraded, new platform, new graphics, now responsive & mobile friendly, new newsletter system, new email system. We were happy to overhaul everything and make it as seamless as possible. We don’t want our business interrupted and we know that you don’t either.